Sometimes, PKMN of the Week travels to far off locations like Austin, TX. Sometimes, PKMN of the Week gets caught up in the heady party atmosphere of the SXSW Conference. Sometimes, PKMN of the Week wakes up in the morning feeling like soldiers from Panzer Command are marching through his head - Eins! Zwei! Drei! This week's Pokémon is that nasty fellow derived from German numerals one, two, three (at least his English name) Hydreigon. Deino for eins, Zweilous for zwei, and Hydreigon for drei. The first time I ever met a Hydreigon was in battle against my friend John. I had no idea how versatile this guy could be - I immediately set out to get one of my own. Unfortunately, since I am not Ghetsis, I couldn't get one without leveling up a Zweilous to 64. I have since abandoned my Hydreigon for competitive battling; you may have other ideas. 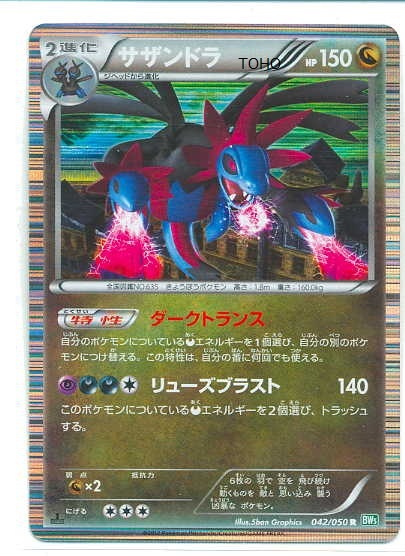 Hydreigon is the Brutal Pokémon (as is Sharpedo) and there's a reason for it - within the 600 club he puts all of his points into his base Special Attack and physical Attack. Base Defense and base Special Defense are his low points, base Health is not much higher, and base speed is right in the middle. If you understand my competitive battling philosophy (or at least what always works against me) hit them hard and don't give them a chance to play out a strategy. Mr. Hydreigon can do this for you nicely. Besides being a harsh attack demon, Hydreigon is well regarded for learning an extremely diverse move set. He learns moves of every type except for Grass-type. STAB moves to consider include Dragon Pulse, Outrage, Draco Meteor, and Dark Pulse (extremely hard to get through breeding). Unfortunately the Dark-type moves available to Hydreigon are pretty weak. Select from the other move types to fit your battle style and you can't lose. Hydreigon can learn two moves that are favorites of mine in competitive battle - Dragon Tail and U-turn. Dragon Tail gets STAB, does damage, and forces the targeted Pokémon out of battle immediately. If you are in a double battle and your opponent is setting up based on a specific pairing this may give you the advantage. U-turn is also a nasty and does well against Psychic and Dark-types. No STAB this time, but it does damage and switches Hydreigon out without taking a Pokémon swap penalty. This is nice if a stronger Dragon, Ice, Bug, or Fighting type shows up that Hydreigon can't handle. I have also seen Hydreigon used well when paired with a Pokémon that can do Ground type attacks (Hydreigon's Levitate ability protects him) or with one with an elemental ability. For example, pair Hydreigon using Surf with a Jellicent with the Water Absorb ability. Hydreigon hits everyone with Surf, Jellicent restores 1/4 full HP AND gets to make a move. Definitely a sweet combo. Dark Sunglasses and Dragon Fang give a little boost to STAB moves depending on which ones you've selected. The Yache Berry will protect your Hydreigon from Ice-type moves (I always worry about Ice-type moves more than Dragon-type moves). Hydreigon is sufficiently versatile that a wide number of items can be held to match the battle style you have selected. I always thought Hydreigon had a cool look, even if he is a somewhat sinister Pokémon. Those two sightless head things for arms and the torn lizard like tail - pretty sweet. Another night out on Sixth St. and I may end up getting a Hydreigon tattoo while I'm down here in Austin . . .